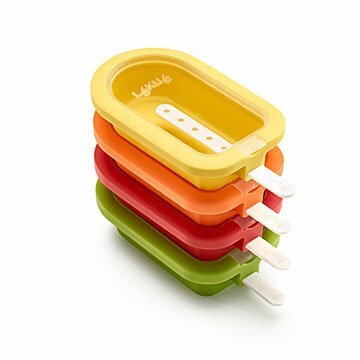 This set of stackable molds lets you make frozen treats without taking up too much freezer space. Your snacks just got a lot cooler. This set of stackable molds lets you make frozen treats without taking up too much arctic real estate. Just fill the four colorful silicone molds with your favorite freezable ingredients or try one of the included tempting recipes, like popcorn caramel cream. The set also includes reusable, adjustable length sticks and mold covers to protect your pops from freezer odors. Made in China. Click here for sweet & thirst-quenching ice pop recipes. The popsicle creation choices are endless. You do have to practice getting them out easy. If you don't put the handle in all the way it works for adult hands. love the stacking, works great for my small freezer. I bought 2 boxes so I have enough on hand for heatwaves. I purchased 2 of these, intending to use one for myself, and give one to my grandchildren for Christmas. I will give the gifts, but will probably not use them myself. Smaller than I anticipated (I did not check specifications). They are really hard to get OUT of the mold once the contents have frozen - Kids could not do it alone. Once the pop was out, they are fine. I like how the molds stack in the freezer. Will use these to make healthy organic popsicles for my grandkids.